Restorative dentistry is a field in dentistry which specializes with the diagnosis and treatment of disease of teeth and its surrounding structures such as the gums and jaws. 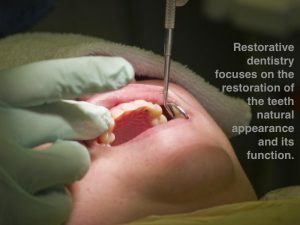 As the name implies, restorative dentistry focuses on the restoration of the teeth natural appearance and its function. There are different treatments under restorative dentistry and the most common include: dental fillings, dental crowns, dental bridges, dental implants and dentures. A dental filling is used to fill the hole or the decayed part of the teeth. This is the first line of treatment in managing dental cavities. This helps in restoring the tooth’s structures back to normal. When the tooth damage is extensive exposing another tooth structure – the dentin, a dental crown is used to protect the entire tooth. A dental crown is a cap shaped like a tooth used to cover the entire tooth in order to restore its natural shape and function back to normal. When you lost a tooth due to extensive damage, you can fill the gap left with a false teeth such as dental bridges. A dental bridge is consist of two dental crowns located at both ends of the dental appliance. The crowns are used to anchor the bridge in place. The middle part of the bridge is called a pontic- the false teeth. To prevent bone loss in your jaw and preserve the original structure of your face, dental implants are used as dental roots when you lose your teeth. They are made from biocompatible materials such as titanium to replace missing teeth. After implants are put into place, a dental crown is used to cover it. Dental implants are also used to anchor dental bridges and dentures in place. Dentures are used to replace your missing teeth. They can be fixed or removable and can be either partial or full. The choice of which denture to use depends on your oral condition.